One of The Project of Florista by Aarav Constructions, located in Wagholi, Pune, Offering Spacious and well-designed 1BHK and 2 BHK apartments at a best price. In Aarav Florista you will find beautiful as well as high quality Apartments / Flats. It is conveniently located at Wagholi in Pune city. The project is well equipped with all the basic amenities to facilitate serene life for the residents. • “Aarav Florista” is all set to take your lifestyle to a new high of finesses. The exteriors welcome you to a world of your dreams. The elevations strike a seamless harmony of structure and utility. It allows ample natural energies to rejuvenate your life that revolves around you ! Step into your beautiful apartment at rite fortune which presents a portrait of life in total harmony. Get greeted by a lavish elevation which offers a splendid ambience which is truly an insignia of your preference for rich expanse of your life-span! "Building your Dream Castle into reality!" Kharadi IT Park – 10-15 Minutes. Pune Railway Station – 25-30 Minutes. Wagholi is a Developing location of the city. 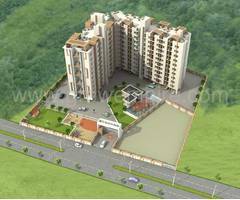 In Wagholi there are number of upcoming and ongoing projects that are available with good prices. It is the Best place because the locations offer inexpensive residential Apartments, the demand in the locality comes from IT/Software industries. Wagholi is well-developed. The property rates in Wagholi, Pune keeps changing and if an investor its good choice of locations because you will get to Maximum profit as per the market movement. 3Rd Floor	: -	Enjoy Table Tennis. 7th Floor	:-	Designed and equipped for exercise, or physical education. 8th Floor	:-	Designed and equipped for exercise, or physical education.